Welcome to issue #84 of the Bootleggers Buzz! Most of you had already noticed this obviously, but this week has been a rather boring one. I think it is the most boring week we have witnessed in a long time. I think we can be very grateful for the fact that that the tenth year anniversary is coming up, so that this boring week was made a bit more interesting! The past few days we are awarded with free bullets and extra money everywhere we go, and we have still got another week in front of us until Friday the 27th. This is the day that Bootleggers opened up its doors, ten years ago. Very exciting isn’t it? In these past ten years we have made a lot of friends, and a lot of enemies. People have come and gone to simply be forgotten after a while. If you would have told me 7 years ago that after all these years I would still be lurking around on this game, I would have laughed at you. But here we are, ten years later since the day Bootleggers opened up its doors for the first time, still keeping the game alive. So, what have we witnessed this special week working towards the anniversary? Well I can tell you; not much has happened this week. We only witnessed a few killings and on the forums there has not been a lot of important discussions worth mentioning. Since our writers didn’t feel like publishing an empty Buzz, they decided to write a couple of awesome columns. ShyGuy wrote about the Private Investigators feature which allows you to hire private investigators to find the location of other players, to verify the accuracy of witness statements and to get witness statements. An extremely important feature, but can we expand this feature to make it even more important? ShyGuy thinks this is definitely possible! We also took a look at the mission feature and discuss whether or not it is worthwhile completing them all. We conducted a survey in the Game Forum and bootmailed several people to get a better view of the usage of this in-game option. 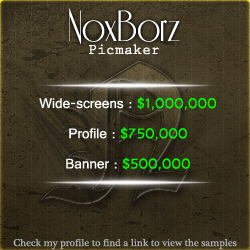 Bran_Stark wrote about all the posts and topics we are seeing lately about returning mobsters to the realm of Bootleggers and one of our newest writers iCypha wrote about the people who make our profiles look awesome; picture designers! Also don’t forget to check out our weekly articles; Behind The Name, Forum Post of the Week and The Weekly Joke are three returning articles which are worth reading every week. We at the Bootleggers Buzz hope you enjoy reading this fine Sunday Issue, and wish you good luck with all the upcoming games and events revolving around the tenth year anniversary of Bootleggers. Enjoy! The page of Private Investigators (PI) allows you to hire private investigators to find the location of other players, to verify the accuracy of witness statements and to get witness statements. An extremely important feature, but can we expand this feature to make it even more important? Definitely. Each week we interview a random player to find out what exactly is behind his or her name. The victim of this week’s issue: Bran_Stark. We here at the Buzz look at the mission feature and discuss whether or not it is worthwhile completing them all. We conducted a survey in the Game Forum and bootmailed several people to get a better view of the usage of this in-game option. Time for a party wouldn't you agree? Tenth year anniversary of Bootleggers is coming up, and we are all still here! Lets not forget one the those crucial roles within the Bootleggers Community, those players who make your profile look attractive. We have had an interview with some of them. This week we came across a topic in the Game Forum about one of Bootleggers original founders: Brightstar. It's a small story about the beginning of Bootleggers. Little Johnny caught his Daddy... Come and see his reaction! It was a rather boring week with nearly nothing to witness. It’s a good thing that we are celebrating the tenth year anniversary of Bootleggers! That's right! We are celebrating the upcoming tenth year anniversary of Bootleggers. Every day when logging in we receive a full day of advantages, with every day being something else. A small update was brought to us! You will see that the finalized percentages are now shown in the Organized Crime invitations. JackArmyi hosted a bust competition in which Seraglioz donated 9,5 million. Because of the many events of this week, we had to fill the Buzz with fine columns written by our wonderful team. Missions; Are they worth it? Our Buzz team looked at this feature and discussed whether or not it is worthwhile completing them all. ShyGuy decided to write a column about the Private Investigators feature which allows you to hire PI’s to find the location of other players and many other things. Why did I come back? Again! Bran_Stark wrote about the return of a Bootleggers, after seeing a lot of forum posts and topics about this. Also take a look at our weekly items!